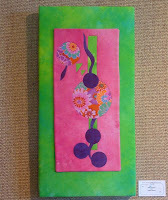 Several of us volunteered to help hang the Cherry Blossom Art show in the local gallery around the corner from my house. It's always a challenge to fit the pieces to the space we have and this time was no different. We ended up with two walls that look really good. For the last wall what we needed was one big focal piece but that wasn't happening so we worked with what we had -- which was a lot of smaller pieces that were more or less the same size. It ended up looking OK, but not as good as the other two walls. My contributions were two small art quilts (pictured above) that I mounted on stretched canvas. Both were done entirely with hand dyes. I've hung them as small quilts before but they look so much more like art now that they are on a frame. I wrapped the canvas with hand dyed fabric and then mounted the quilt on that. I got the idea for displaying the quilts this way from Myrna Giesbrecht. love the quilts and great idea to hang them on canvas never thought of that.